Version of BD600 with Extended Remote capability. The BD600E features expanded remote programmability with 16 bipolar opto-isolated inputs which may be configured to drive many BD600E functions or as general-purpose delay inputs; 16 open-collector outputs that may be configured to display BD600E status indicators or to pass through delayed versions of the inputs; and an RS232 output provides a delayed version of the input, useful for driving a time display or for other control purposes. Any BD600 can be field upgraded to a BD600E with the E-Option upgrade kit. The BD600 adds more delay protection, improves fidelity, and expands remote options, while maintaining the user interface and yellow DUMP button familiar to all radio engineers. It is the culmination of thirty years of designing and manufacturing highly reliable delays for broadcast. Featuring 80 seconds of delay, 24-bit digital and analog I/O, plus a host of new features, the BD600 is the new world standard. The BD600 offers an unprecedented 80 seconds of the highest quality revenue and license-protecting delay - twice as much as other delays. You have the flexibility to customize the delay buffer length from four seconds to the full 80 seconds. Dump can be customized in 1/2 second increments up to 10 seconds. Each time the DUMP button is pressed, only one segment is deleted. For example, if a unit is set to the full 80 seconds of delay buffer, and is set up to provide 8-second dumps, you will have ten separate dump segments. Pushing the DUMP button the first time cuts out one 8-second segment. You still have 72 seconds of delay protection. If this is followed by more trash-talk, push the DUMP button again and you still have over a minute of delay protection. The "sneeze" button momentarily "edits" audio entering the delay, allowing the host to sneeze, cough, or make a short comment without being heard on air - and without dead air. Your station cannot afford to work without a net. With the BD600, you will never worry about running out of delay memory. The unit shows not only an exact digital readout of delay time, but also has a "quick read" bar graph which instantly confirms "you're safe" at a glance. 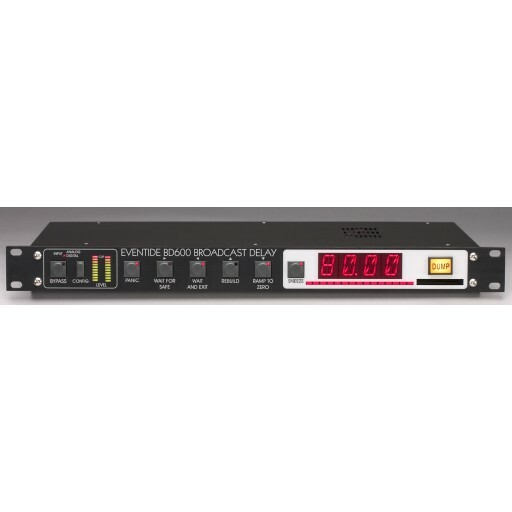 The BD600 is an 80-second stereo delay unit featuring analog XLR-type inputs and outputs, as well as AES/EBU digital audio inputs and outputs. All front panel switches (except "configure") can be remoted, as can the status indicators. Both RS-232 in and out are included; four configurable control inputs and two configurable relay-isolated control outputs are provided via an easy-to-wire Euroblock barrier strip. The Optional BD600 Extended Remote is perfect for more sophisticated automated broadcast chains. 16 bipolar opto-isolated inputs may be configured to drive BD600 functions and general-purpose delay inputs. 16 open-collector outputs may be configured to output BD600 status indicators or to pass through delayed versions of the inputs. An RS-232 output provides a delayed version of the input, useful for driving a time display or for other control purposes. Compact Flash Interface Supports Type I and Type II Compact Flash cards for .WAV sample playback and software update.